For state departments and health organizations who would like to set up a group program in their community or many group programs in their entire state. Being physically active is an essential part of living healthy. Regular physical activity not only enhances general well being, but improves physical and psychological health, delays onset of frailty and helps preserve independent living. Our exercises are developed to encourage older adults and seniors aged 55+ to become more active, participate in a social network, reduce the risk of injuries and falls, as well as enhance self-esteem and independence. Who can start a group program? 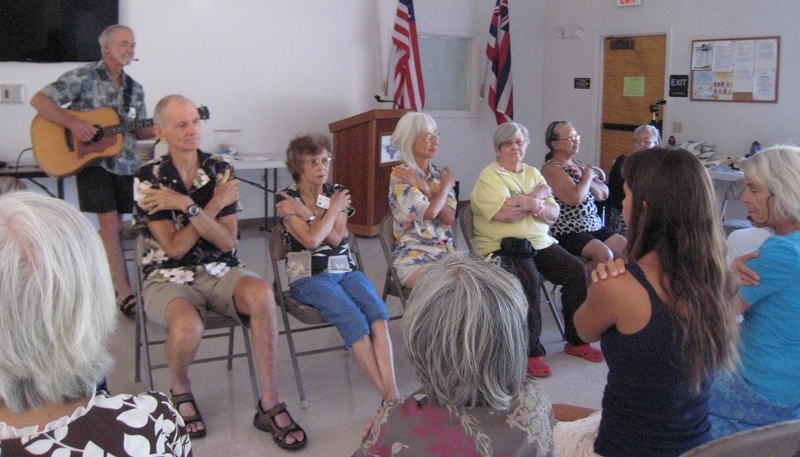 Group exercise and falls prevention classes help seniors and people with disabilities living in the community to stay healthy and active. and many more places where elders gather. Many Group Leaders in many states are excited about the health improvements they see in the Move With Balance elders. State of Arkansas: There are 26 Move With Balance sites operating in Arkansas. “I wanted to let you know how many compliments we are getting for your program. I personally led a Move With Balance group for over a year and have seen the progression in the seniors I work with. I just trained eight more leaders yesterday. We have six classes going now throughout the White River region of Arkansas and are expecting to have six more going before the end of January. Thank you! For more information on the program please visit How Move With Balance Works. This package has been specially formulated for organisation who wish to run a Move With Balance program in their community. Move With Balance is different from other group programs in that the activities work with the brain and the body simultaneously. The elders are always learning and challenging themselves. We are unique in that we have brain integration art and socialization time. Elders of all levels and abilities, mentors and mentees attend class one and a half-hours a week for 10 weeks. Classes are progressive, becoming increasingly difficult over the 10 weeks. Participants practice exercises at home and review the provided health information related to preventing falls. A variety of simple equipment is used, including bean bags, balls, shakers, and simple musical instruments. Ideally, every senior is paired with a mentor to encourage socialization and safety. You will learn how to design a group program by recruiting and training active seniors mentors, who in turn volunteer mentor the frail elders, the mentees. The group leader becomes the facilitator, leading the activities while the mentors individualize the activities for the frail elders in a safe, loving environment. All participants experience enhanced balance, vision, coordination, and cognitive function. Take a look at the Complete Training Package and the Mini-Training Package, and purchase whichever one suits your needs. Implementing a group program in your community is easy. Start by purchasing the complete training package or the mini-training package. If you have any questions or concerns, please don’t hesitate to contact us. 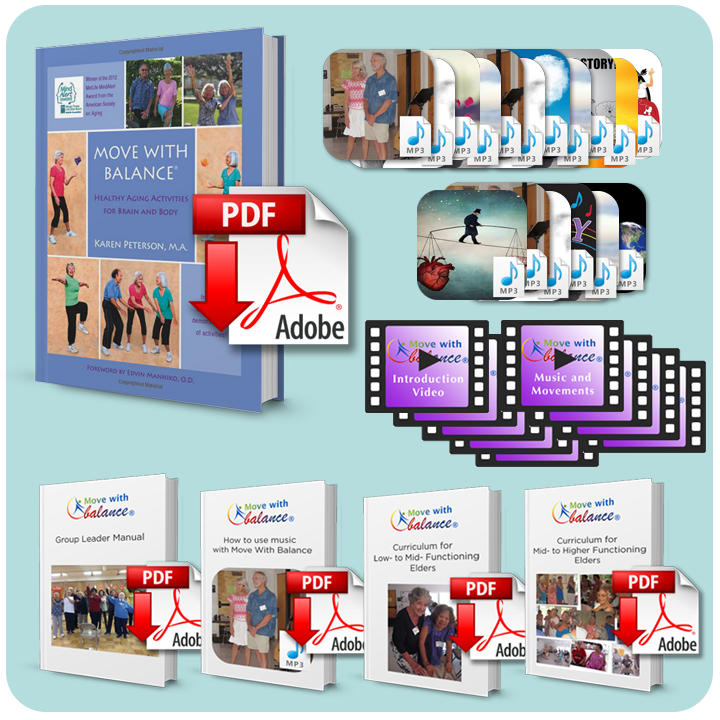 The package for group programs includes two manuals, How to use Music with Move With Balance and Curriculum for Low-to Mid-Functioning Elders, that will teach you how to adapt the program to the needs of elders with Alzheimers and/or dementia. We also feel it is extremely important to include families and caregivers as an important component in working with Alzheimer’s/dementia mentees. Please visit Alzheimer’s and Dementia for more information on our special curriculum. Do you have some questions or concerns about how the Move With Balance program can be implemented in your county or facility? Please don’t hesitate to get in touch, we would be delighted to help.